Abu Dhabi, UAE – 9 October 2018: Under the patronage of His Highness Sheikh Mohammed bin Zayed Al Nahyan, Crown Prince of Abu Dhabi and Deputy Supreme Commander of the UAE Armed Forces, the second edition of the Mohamed Bin Zayed Majlis for Future Generations opened today with an address from Her Excellency Shamma bint Sohail Al Mazrouei. Al Mazrouei, the UAE's Minister of State for Youth Affairs, addressed attendees at the Abu Dhabi National Education Centre (ADNEC) to kick-off two days of future-focused activities. More than 300 interactive sessions are being held at ADNEC across October 8 and 9 to engage Emirati youth with the UAE's culture, social, and technological leaders. The Majlis, where ‘leaders of today meet the leaders of tomorrow,' also sees the involvement of 50 partners including Expo 2020, the Special Olympics, Mubadala, and Masdar, among others. Introducing the Majlis, HE Shamma Al Mazrouei, who referred to herself as “the student” in her address, highlighted the value of hard work as she offered examples of self-growth and development from her experiences as a young Emirati. HE Shamma Al Mazrouei described how when deciding which study option she should pursue, her parents encouraged her to choose the sciences rather than the arts as they recognized the future benefit of such knowledge. Only later in life did she realize the true advantages of this decision. After then gaining a bachelor's degree in Economics from New York University Abu Dhabi, HE Shamma Al Mazrouei earned her master's degree in Public Policy at the University of Oxford. Here, she understood the responsibility she held as an Emirati studying abroad. “Oxford was tough as I was one of the youngest students, but it was a pleasure to gain knowledge that I knew would one day support the UAE,” commented HE Shamma bint Sohail Al Mazrouei, Minister of State for Youth Affairs. “I realized during my studies that I had a responsibility as an Emirati to represent my country, and that's why I worked so hard - to prove myself,” she added. Reflecting on the UAE's growth as a nation, HE Shamma Al Mazrouei also reminded the audience that everything built and established in the country is a result of the efforts of the UAE's hardworking citizens and residents. 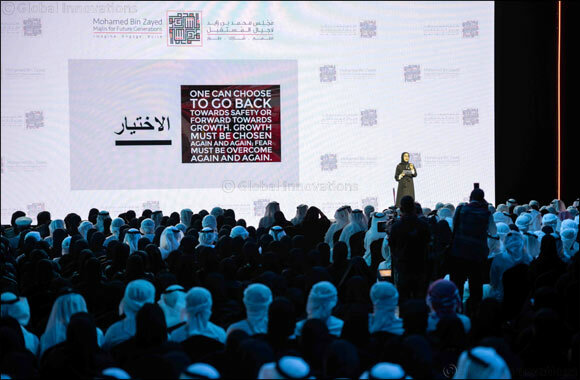 Urging the UAE's future generation of leaders to pursue their own professional goals - spurred on by this year's Majlis – she emphasized the importance of working toward a future not for others, but for the growth and development of oneself: “Study not to fulfill the desires of those around you, but to fulfill the goals and aspirations you set for yourself. Follow your own ideals and values on the path to success,” commented HE Shamma Al Mazrouei.